Regardless of the type of bearings employed, turbochargers share the same design elements – there’s the turbine (aka exhaust) side, compressor (aka inlet) side and the centre cartridge which incorporates the lubrication and cooling systems. The turbine side of the turbocharger comprises a finned wheel that spins inside a cast iron housing. 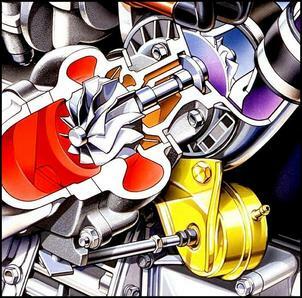 The turbine wheel is driven by the engine’s exhaust gasses and a wastegate valve regulates the shaft speed in order to limit boost pressure. The turbine wheel is connected to a turbine shaft that has a compressor wheel attached to the opposite end. The compressor wheel spins inside an aluminium housing and generates the boost pressure that gives your engine more power. As shaft speeds can easily exceed 100,000 rpm there’s an obvious need for a heavy-duty bearing assembly. The bearings typically support the shaft in two locations along its length and, in a sleeve bearing turbo, a thrust bearing is required to control axial load. Most modern turbochargers also incorporate water cooling to remove heat from the cartridge assembly and stabilise operating temperatures. Sleeve bearings were the bread-and-butter of mass produced turbochargers until Nissan introduced ball-bearing technology to the market in the late ‘80s. So what exactly is a sleeve bearing (aka journal bearing) turbo? As its name implies, a sleeve bearing turbo employs a pair of bearings that fit around the turbine shaft (like sleeves) and allow it to rotate within the cartridge. 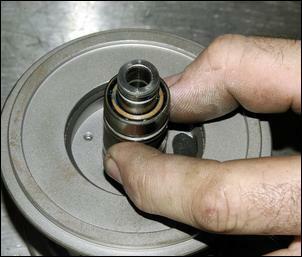 The sleeve bearings, which are usually made from bronze, are inserted into both sides of the cartridge where the turbine shaft passes through - as seen in this photo. 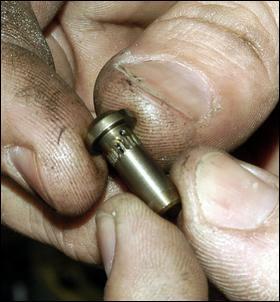 A small retaining clip is used to hold each bearing in place. The turbo sleeve bearings have a series of small diameter holes around their circumference – and these are vital. These small holes enable a high pressure supply of engine oil to form a ‘cushion’ between the turbine shaft and the bearing surfaces. In other words, the turbine shaft is suspended in oil and should not have any metal-to-metal contact. While the sleeve bearings let the turbine shaft spin and control radial loads, a thrust bearing is necessary to control axial load. The thrust bearing is fitted on the outside of the centre cartridge and, similar to sleeve bearings, there’s a high pressure cushion of oil that’s formed to prevent metal-to-metal contact. 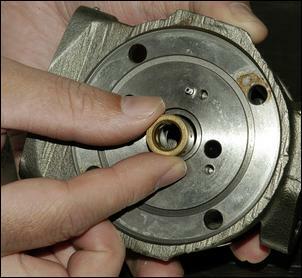 This photo shows the thrust bearing fitted around its associated thrust collar – the tiny oil supply passages can also be seen. Note that the thrust bearing is fitted to the compressor side of the turbo only. While the thrust bearing is typically made from bronze, the thrust collar (seen here) is made from tool steel. The thrust bearing assembly (the thrust bearing together with the thrust bearing collar) is fitted to the cartridge using dowels to ensure the oil passages are aligned. Finally, a backing plate is fitted over the thrust bearing assembly. 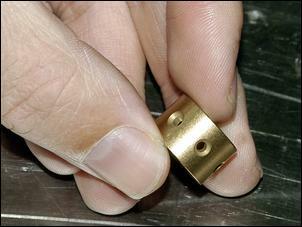 The backing plate is typically held on by a large retaining clip. The turbine and compressor housings can now be installed and the turbocharger starts to take shape. So that’s a sleeve bearing turbo – what are its advantages and disadvantages? Well, as evident by its widespread use, the biggest advantage of a sleeve bearing turbocharger is relatively low production cost. They can also tolerate turbocharger harmonics and vibration because the turbine shaft rides on a cushion of oil. The relatively high flow/pressure of lubricating oil also helps remove turbocharger heat which means water cooling is not essential (although it is preferable). The bearing materials in a sleeve bearing turbo are quite soft, are heavily reliant on oil pressure and are susceptible to damage from contaminated oil - this photo shows a ‘coked up’ centre cartridge. They are particularly sensitive to oil related problems in the thrust bearing area where clearances are only a few hundredths of a millimetre. 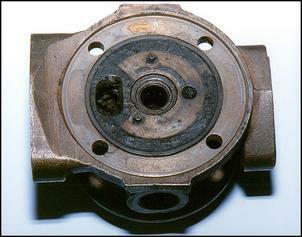 Risk of thrust bearing damage is significantly increased whenever turbo boost is increased above standard. Note that many sleeve bearing turbochargers can be upgraded with a heavy duty thrust bearing. A typical thrust bearing provides only 270 degrees of load carrying area. An alternative is a full-circle 360 degree thrust bearing which gives the maximum possible load carrying area. 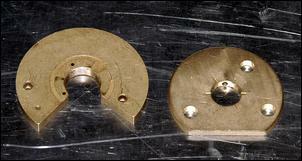 This photo shows a conventional 270 degree thrust bearing alongside a 360 degree version. 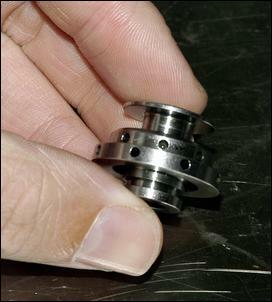 Fitment of a 360 degree thrust bearing requires the use of a two-piece thrust collar. Ball bearing turbochargers are fundamentally the same as their sleeve bearing counterparts except they use a pair of angular contact ball bearings instead of the combination of sleeve/thrust bearings. Note that this type of ball bearing turbo is sometimes referred to as a dual ball bearing turbo – this differentiates it from some ‘hybrid’ ball bearing turbos which use a combination of ball bearings (on the compressor side) and a sleeve bearing/thrust bearing (on the turbine side). Turbonetics is one manufacturer of hybrid ball bearing turbos. Similar to a sleeve bearing turbo, the turbine shaft in a ball bearing turbo is suspended at two points along its length. However, instead of the shaft spinning in a cushion of oil with bronze sleeve bearings, it spins the inner race of two ball bearing assemblies. Each of the angular contact bearings is designed to control axial loads as well as radial load – but only in one direction. One of the angular contact bearings is oriented to receive axial load toward the compressor and the other bearing receives load toward the turbine. Axial shaft movement is eliminated by the centrifugal force of the angular contact ball bearings (when the turbo is spinning). The ball bearings, which are typically made from stainless steel, are caged and fitted inside a bearing carrier tube which slides into the cartridge. The carrier tube is usually held in place by a series of clips, a small bolt and a locking pin inside the oil supply hole. This pin also acts as a restrictor to reduce the oil pressure fed to the turbocharger – ball bearing turbochargers survive on significantly less oil pressure/flow compared to a sleeve bearing turbo. 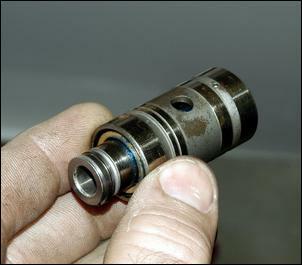 Once passing through the oil feed restrictor (seen here), oil enters the centre cartridge and lubricates the twin ball bearings. Oil also falls directly onto the turbine shaft to further aid lubrication and improve cooling. An internal void serves to reduce oil pressure so oil can be gravity drained into the engine’s sump. Perhaps one of the most overlooked aspects of ball bearing turbochargers is their relatively small lubrication requirements. Put simply, ball bearing turboss require only lubrication of the steel balls while sleeve bearing turbos rely on substantial oil pressure to maintain proper bearing surface interaction. So what are the advantages and disadvantages of ball bearing turbos? Well, with much reduced shaft drag, they’re faster to spool up, are more efficient across the operating range, can sustain more boost due to their massive thrust load capacity (there’s no thrust bearing to cause problems) and can survive with modest oil pressure/flow. Their relatively low dependency on oil pressure also means they suffer less wear during engine switch-on and switch-off. The only disadvantages of a ball bearing turbo are increased production cost and a greater dependence on water cooling (because there’s less heat conducted away by oil). 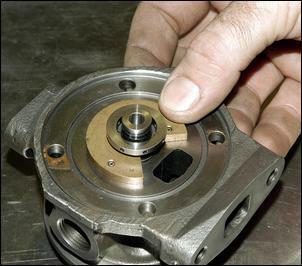 Most ball-bearing assemblies are also designed to be replaced as a complete unit rather than rebuilt.